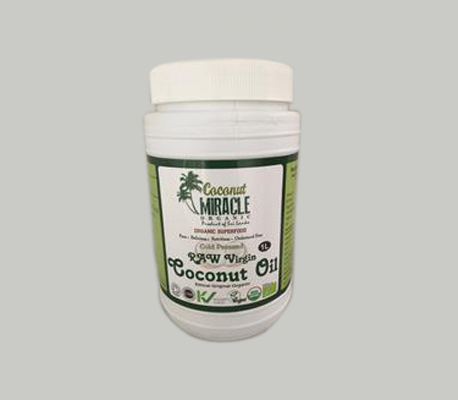 Coconut Miracle's NEW 1L food grade plastic giant tub of raw organic cold pressed virgin coconut oil. More oil for your spend!!. Handpicked in the tropical island of Sri Lanka, fresh coconuts are cold pressed to produce extra virgin oil with a delicate flavour reflecting its purity and retaining all natural anti oxidant properties. Usage - Nutritious /delicious/ cholesterol free great for eating, cooking, frying (smoke point 177 degrees C) baking, in smoothies, drizzling, sprinkling, in vegetable mashes. coconut flour is made using de-fatted coconut meat from the same cold-pressed coconuts used to produce organic coconut oil. Take care when using organic coconut flour to enrich your buns, breads, cakes or cookies though - it is of a slightly different consistency to normal flour, and it is important to remember that you must add an equivalent amount of extra liquid to your recipe to compensate for this. Coconut flour can be stored for up to a year in a cool, dark place.